A flier for the upcoming Hijab Day at Brenau University. Please join Brenau’s International Club for a cultural learning opportunity next week as we explore the significance of the hijab to Muslim women. The festivities begin March 29 with a student-led presentation at 6 p.m. in the senior dining hall. Brenau students, staff and faculty are encouraged to wear headscarves all day March 30, using the hashtag #buhijabday to tag themselves on social media. 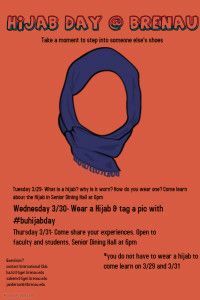 A second senior dining hall student presentation will take place at 6 p.m. on March 31, where individuals can discuss their experiences wearing the hijab.